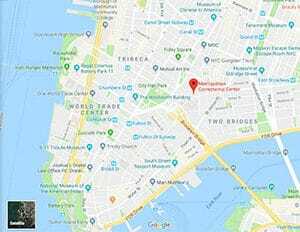 Location: MCC New York is located in downtown Manhattan, adjacent to Foley Square and across the street from the federal courthouse. Background: MCC New York is a 12-story high-rise which was built in 1975. It houses primarily pre-trial detainees and holdover inmates. Most prisoners held at MCC New York have pending cases in the United States District Court for the Southern District of New York. The facility also holds prisoners serving brief sentences. The Los Angeles Times stated that the prison is often referred to as the “Guantanamo of New York,” and The New York Times stated that its administrative segregation units have severe security measures. Numerous high-profile individuals have been held at MCC New York during court proceedings, including Gambino crime family bosses John Gotti and Jackie D’Amico, drug kingpin Frank Lucas, Ponzi scheme mastermind Bernard Madoff, terrorists Omar Abdel Rahman and Ramzi Yousef, and weapons trafficker Viktor Bout. In January 2017, after being extradited to the United States, Mexican drug lord Joaquín “el Chapo” Guzmán was housed in the facility. Housing: Inmates are housed in one of 10 housing units. Two of the housing units each have 20-person dormitories, while the other eight consist of two-person cells. Health Services: Health care includes general medical and dental treatment. This includes nutritious meals, proper bedding and clothing, a laundry schedule, regular showers, a regular exercise period, and toiletry articles. Emergency medical care is available 24 hours a day. Inmates must submit sick call forms for routine health care needs. Psychology Services: Psychology services include screening for signs of suicide and referral to the Psychology Department to address emergency concerns. Residential Drug Abuse Program (RDAP): MCC New York does not house a Residential Drug Abuse Program (RDAP). The Drug Education Class and the Non-Residential Drug Abuse Program (NR-DAP) are also available. Education Services: GED courses are available to inmates at MCC New York. Advanced Occupational Education: MCC New York does not offer any advanced occupational education programs. Vocational Training: MCC New York does not offer any vocational training programs. Apprenticeship: MCC New York does not offer any apprenticeship programs. Library Services: Inmates at MCC New York are provided access to legal materials and an opportunity to prepare legal documents through the use of the TRULINCS Electronic Law Library. The library also provides a wide range of reading materials for educational and recreational purposes, including magazines and newspapers. UNICOR: MCC New York does not house a UNICOR facility. Commissary: Inmates are allowed to spend up to $360.00 on commissary purchases monthly. Popular items include food, beverages, radios, and other items. Recreation Services: Inmates at MCC New York have limited access to recreation facilities. Most of the activities occur inside the facility, including watching movies.